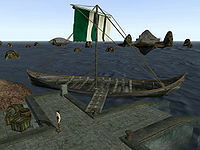 The Wild Wave is a ship owned by Viania Claeni, plying the Sea of Ghosts from the docks in Bal Oyra. On the jetty nearby are several crates and barrels containing food and clothing. The name of the ship is only mentioned in dialogue, where Viania Claeni tells you "My ship, the 'Wild Wave,' can carry you to Firewatch, Tel Ouada or Bahrammu for an insignificant sum." This page was last modified on 6 March 2019, at 09:15.